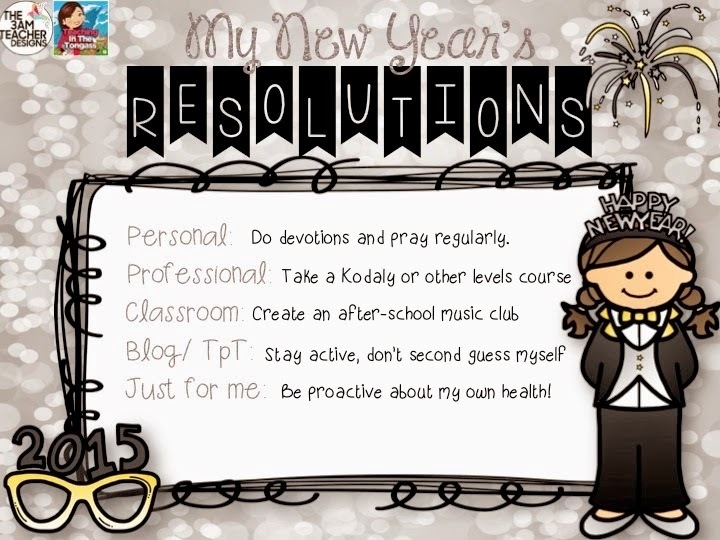 I'm teaming up with Aileen Miracle for a New Year's Resolution Linky Party! My faith is very important to me, but somehow between having two babies in the last three years, working full-time, being a wife, volunteering at church, starting a TPT store, blog, and Facebook page, I haven't really squeezed time in for my relationship with God (gee, I wonder why . . . ). My plan this year is to take some time for myself each day (or at least every other day), away from all of the busyness, to focus on growing in my relationship with Christ. I would really like to start a small music club for students who love music. I think it would give my program even more momentum and encourage students to continue in music when they leave elementary school. I'm thinking a recorder club or upper-elementary music club that would meet maybe 1-2x per month. This year I have 25 students who have made it into the Elementary Honors Choir in the area, so I think our after-school practices will count for that! Anyone who has had a music club, I'd love to hear what you've done! I just started both of these in the last 6 months. It can be overwhelming when you look at the blogs and TPT stores of other teachers who have been doing this much longer than me! They seem to have it all together and have a huge following, and I'm just getting started!! But, I also have 10 YEARS of teaching experience that I have to offer to people through my blog posts and products. I have always had the ability to come up with unique songs and chants, but have never really tried to put them "out there" because I second guess myself. This year, my goal is to be ME and not try to be anyone else. And to know that there is a lot of value in what I have learned in the last 10 years of teaching!! I'm one of those people who needs 8-10 hours of sleep each night--not kidding at all, just ask my co-workers! For a long time I got much less sleep than that because other people could survive on less sleep, why couldn't I? Well, let's just say I'm a much more pleasant and healthy person when I get enough sleep :) So, healthy sleep habits it is! Also, I have some small nagging health issues I need to take care of to feel my best. Time to be proactive to feel the best I can!! I would definitely recommend finding a program where you can do Kodaly training! :) I think you will be surprised how much it will change you and your teaching!